Objective: Although hallux valgus is a common diagnosis and there are different well-described techniques for its correction, the presence of this deformity associated with a diagnosis of metatarsus adductus is relatively uncommon, and there is no consensus regarding surgical treatment. 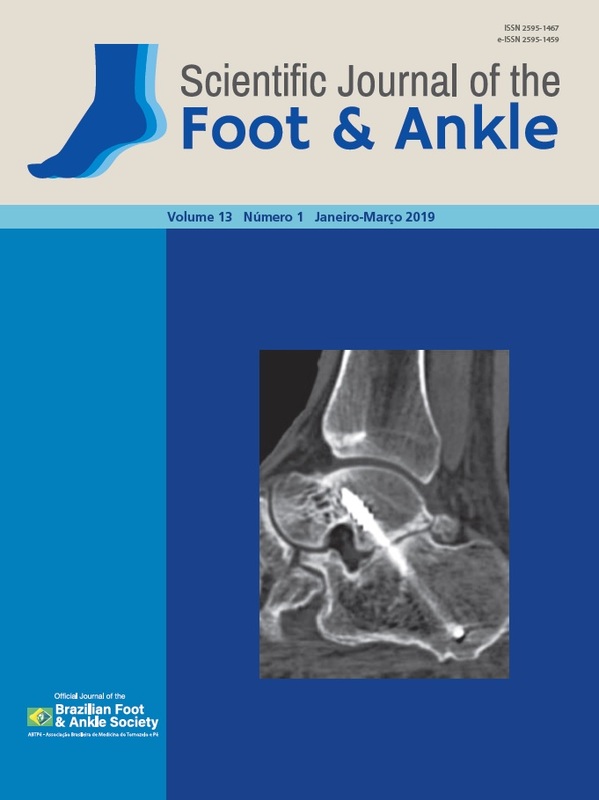 The objective of this study was to evaluate the preliminary radiographic results of angular corrections obtained in a series of cases of the surgical treatment of severe hallux valgus associated with adduction of the metatarsal bones, following the technique proposed herein. Methods: Retrospective data were collected from the medical records and pre- and postoperative radiographs of patients subjected to Lapidus arthrodesis combined with lateral rotation osteotomy at the bases of the second and third metatarsals. The following angular measurements were performed before and after surgery: hallux valgus angle, intermetatarsal angle, and the degree of adduction of metatarsal bones (measured by Sgarlato’s and Engel’s angles). The mean follow-up period was 18 months (16-24 months). Results: The mean hallux valgus correction angle was 31° (19-53°), and the mean intermetatarsal correction angle was 5.771° (2-9°). Regarding the forefoot adduction, the mean correction angle measured by the Sgarlato technique was 15.57° (12-21°) and by the Engel technique was 15.71° (10-22°). All of the measured angles decreased significantly in the postoperative assessment. Conclusion: Lapidus arthrodesis combined with rotational osteotomy at the bases of the second and third metatarsals proved to be effective for correcting the adduction of the metatarsals, allowing for the alignment of the first metatarsal and consequent correction of the deformity. Level of Evidence IV; Therapeutic Studies; Case Series.